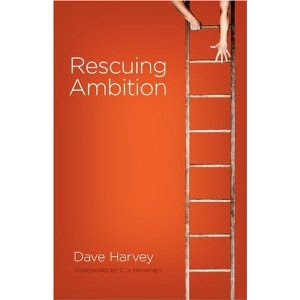 Rescuing Ambition was an exciting read. It stirred up feelings of elation and amusement all at once. I was convicted and gratified, encouraged and corrected. In short, it was awesome!!!! In other words, have your dreams and pursue them even. But test them and see if they are God-given and are built out of a desire to do things for God's glory or your own. Therein lies the distinction and frequently the dilemma. I think that this book is incredibly important for the pious Christian who walks with downcast eyes who do not dare to do anything big for fear that they will overstep their humility bounds. This book is a very kind (and really amusing, thanks to the author's humor and wit!) slap in the face that says, "Hey YOU! God made you to be ambitious!" The other glorious thing is that Harvey doesn't say that the only way that one can pursue their ambitions rightly is is they declare their intent to be a missionary on foreign fields. Housewives can be ambitious, just as business man and teenagers can be - right where they are, pursuing the passions that God placed inside of each one of them. "Glory grabs us. But even more than that, it arouses something in our souls. It stirs us. We experience something totally vicarious, some strange exercise in identification. And make no mistake, it goes deep. It calls to something we value. To do something that matters. To seek something greater than our own puny existence. It's an instinct for glory. It pops up in a stark contrast Paul portrays in Romans between two groups of seekers. On one side are "those who by patience in well-doing seek for glory and honor and immortality"; on the other side "those who are self-seeking." To the first group, God "will give eternal life"; for the second, "there will be wrath and fury" (Romans 2:6-8). So the first thing to note is: Ambitions are good! If you don't have them (or don't think you do) then Harvey suggests, in so many words, that you examine who you live your life for. The second thing to note is that ambitions can cause us trouble if we are pursuing them for the wrong reasons or with an incorrect motive. We are glory seekers, after all, and frequently we (I) find that our greatest delight is in seeking our own glory. "Sometimes it gets pretty bad. I want to claim King Solomon's boast: "I became great and surpassed all who were before me" (Eccles. 2:9). Yeah, who wants to be just "good" or "equal"? "Great" and "surpassing all" sounds so much better. Come on, folks, crown me the Sultan of Awesome and parade me through the streets filled with people yelling my name. Make sure everyone's there from my old neighborhood who ever dared question my greatness. I'll capture it on Facebook for anyone who missed it. It is easy to get caught up in how much we are doing for ourselves. I like to think of myself as a pretty great person. So I found Harvey's words of advice and admonition to really examine one's self and one's motives to be apropos. The best advice though, and the one that I think we all like to ignore, is to have "mirror" friends. Those are the ones who will call you on the carpet for misplaced motivates. They are the ones who will ask you the "why" behind the actions you have decided to take. If you have such "mirrors" in your life, the chances of you staying the course and ultimately seeking God's glory are higher. Without people in our lives who are allowed to become close enough to ask the "why" - we are setting ourselves up for failure in this department. I'm very blessed to have mirror friends in my life. It is admittedly hard for me when they ask me, "WHY are you doing this?" I tend to become defensive and offended. How dare s/he question my motives? But I got the point Harvey was trying to make and I'm learning to be grateful that I have friends close enough to ask me those important questions. I can see that God has gifted them to me to draw me closer to Himself and keep me focused on Him. Lastly, I did appreciate Harvey's discussion about meeting with failure - for certainly we all will. "Most people view failure like the flu - avoid it at all costs. We stay away from others who fail, as if we're afraid we might be infected with failure germs. That's a bit shortsighted, not to mention insufficiently biblical. It is a good word to me to be told to examine my motives and realize that sometimes my "good ideas" are born from a sinful attitude or thought. I should check in with God periodically (heh) and see if He REALLY wants to pursue all of my "GREAT ideas!!!" or if I should back off or be a bit more patient with my genius. At the same time, I KNOW I've been pursuing some great things that have just not worked out the way that I wanted them to. Plans have been thwarted. What was supposed to be easy and joyous has been a tumultuous road. What about the plans that I was pursuing because I really felt like God was leading me somewhere that ended up all, well, messed up? At the same time, I should hold onto godly ambition and pursue it! Why? Because that's what I was made to do! I couldn't recommend Rescuing Ambition more highly. Thanks to my favorite Crossway Books for sending me this book to read. I am WOW-ed! Ambition is good, huh? Well, I'm glad to hear that! :) Like you I tend to rush into things and then have to re-evaluate later. Waiting on God is NOT easy. Excellent review. So much of what you say here resonates with me. I'm going to pass this title on to someone near and dear to me. I think it is the word "ambition" itself, not the concept of pursuing dreams, that seem so related to pride. But passion, yes -- that's all too lacking in Christendom. Whatever we call it -- this sounds like a good, balanced book.